Qigong is a simple system composed of gentle movements, meditation and breathing techniques that cleanse and strengthen the immune system and Life Energy (Qi). It can be used as a daily routine to promote health and well-being, reduce stress and help cure or alleviate sickness. It is a powerful system of healing and one of the oldest methods of traditional healthcare in China. There are several variations on the spelling, but regardless of the spelling it is always pronounced “chee gung”. 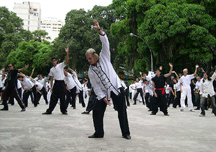 The most commonly used variation is Qigong. The most profound benefits of Qigong are perhaps those that are most subtle. They are the cumulative effect of repeated practice and result in living a calmer, fuller life. Sometimes the benefits are not even fully realized until students experience a period of time where practice becomes irregular. At the point students often begin to feel less balanced and may not cope with stress as easily. The lack of practice reveals all the benefits that the student was receiving and often taking for granted. Each moment we are experiencing change. We are either getting better or getting worse. Through Qigong students learn how to practice self-cultivation so change is moving in the right direction. Qigong is an ancient Chinese system of exercise and meditation that makes the mind and spirit tranquil, improves performance in sports, and cultivates health, well-being, and long life. Thus, there are three major kinds of qigong: spiritual, sports, and healing. It is a spiritual discipline, inspired by ancient Chinese shamans, Taoists, and Buddhists, all of who sought harmony and peace in the solitude of nature. 1. Well-being and improved health. Qigong emphasizes the whole body, whole system health. While it is true that qigong will often cure specific ills, this is not the primary reason for practice. It is not only a matter of adding years to your life, but life to your years. “Qigong, chi kung, or chi gung (simplified Chinese: traditional Chinese: pinyin: qìg?ng; Wade–Giles: chi4 gong1; literally “Life Energy Cultivation”) is a practice of aligning breath, movement, and awareness for exercise, healing, and meditation. With roots in Chinese medicine, martial arts, and philosophy, qigong is traditionally viewed as a practice to cultivate and balance qi (chi) or what has been translated as “intrinsic life energy”. Typically a qigong practice involves rhythmic breathing coordinated with slow stylized repetition of fluid movement, a calm mindful state, and visualization of guiding qi through the body. Qigong is now practiced throughout China and worldwide, and is considered by some to beexercise, and by others to be a type of alternative medicine or meditative practice. From a philosophical perspective qigong is believed to help develop human potential, allow access to higher realms of awareness, and awaken one’s “true nature”. Yang-Sheng (Nurturing Life) is a FREE e-magazine and a network for health care professionals, complementary medical practitioners, Qigong, Tai Chi, Yoga, Reiki and other mind-body and spirit cultivators. It promotes methods of self-healing, positive mindfulness and health preservation. Yang- Sheng merges traditional knowledge with modern scientific research and clinical evidence and combines ancient wisdom with modern experience to support health and well-being. It includes abstracts of the most recent research on mind-body medicine, articles on the practice of Qigong, book reviews, food as medicine, and current events in Qigong, Tai Chi, and Energy Medicine. To subscribe to the e-magazine and read the current issue, go to theYang Sheng home page for more information. Qi: The Journal of Traditional Eastern Health and Fitness – Qi Journal has “real” articles on the topic of Qi, written by those who are currently teaching and practicing the disciplines and who are willing to share their experiences for the advancement of others. All articles are peer-written. The Empty Vessel – The Journal of Daoist Philosophy and Practice – The Empty Vessel is a quarterly publication dedicated to the exploration and dissemination of non-religious Taoist philosophy and practice. Gain a deeper understanding of the shifting sands of our times through the ancient, but universal truths of Taoist philosophy. The Journal of Chinese Medicine – The Journal of Chinese Medicine is the foremost English language journal on all aspects of Chinese medicine including acupuncture, Chinese herbal medicine, dietary medicine and Chinese medical history and philosophy. T’ai Chi – The International Magazine of T’ai Chi Ch’uan -T ‘ai Chi Magazine is the leading international magazine for persons interested in Tai Chi Chuan (Taijiquan), qigong, and other internal martial arts, as well as those interested in similar Chinese disciplines which contribute to fitness, health, and a balanced personal sense of well being. The Townsend Letter – The Examiner of Alternative Medicine – Townsend Letter, the Examiner of Alternative Medicine, publishes a print magazine about alternative medicine. It is written by researchers, health practitioners and patients. As a forum for the entire alternative medicine community, we present scientific information (pro and con) on a wide variety of alternative medicine topics. KungFu Magazine – Kung Fu Tai Chi presents the full spectrum of Chinese culture, including healing, philosophy, meditation, feng shui, Buddhism, Taoism, history and the latest events in art and cinema, plus insightful features on the martial arts. It is the largest English language magazine that provides exclusive coverage of the Chinese martial arts and associated disciplines. KungFuMagazine.com, is an e-zine, and Kung Fu Tai Chi is a print magazine. Chi Talk Newsletter – Energy Arts, Bruce Frantzis. IMOS – Into Mountains Over Streams: a Journal of Qigong & Taiji Culture, online. Inner-Strength e-Newsletter: Articles and information from Dr. Ted Cibik. Breathe Deep Newsletter – Contains current events, China trips, upcoming Qigong seminars, and observations and insight on the practice and philosophy of Qigong:”I know in the depths of my wisdom that I create this world I experience each day… I create it through the overt choices that I make which guide the flow of my outward life… and I create it through the subtle energy shifts that come from the thoughts and intentions I hold, from the Qi (life-force energy) field I generate around me, and from the unconscious holdings and emotions that I carry with me. It appears that we “attract” what we think and feel… I believe it goes to another level and that we resonate at a certain harmonic and this actually molds the world around us. It’s almost too simplistic and misleading to say that we attract and draw in what we hold in our minds. I see the tremendous power each of us has to actually shift and change the subtle energy field around us and “create” our world. This sounds like a mental exercise or word play, but I think there is an important, albeit subtle difference… To “attract” means that you assume that something is already out there; accepting a duality where “you” seek/avoid something outside yourself. On the other hand, to “create” only allows for a unified field where there is nothing outside you… it immerses you in a state of total responsibility where you acknowledge and embrace your interconnection with all you experience”. Francesco Garripoli. Breathe Deep Newsletter Issue 36, December 2006. Qi Magazine was founded in 1990 by Michael Tse as a means of helping his students learn more about Chinese culture. Often his students would ask the same or similar questions in class and so he felt he could benefit more people with his knowledge by offering the Qi Magazine to them and also a wider audience. The magazine grew from a small black and white booklet to a proper magazine that was distributed all over the world. Qi Magazine has now ceased production, but not after 18 years and 90 issues all packed with rare and unique articles covering all aspects of Chinese Qigong, martial arts, culture and philosophy. This wealth of information is now available to everyone as you can now download every single issue of Qi Magazine ever produced, in .pdf format for free. A number of printed issues are available to purchase in sets. Singing Dragon Newsletter – Monthly newsletter on books on complementary and alternative health, Tai Chi, Qigong and ancient wisdom traditions for health, wellbeing, and professional and personal development. Singing Dragon Press is one of the most prolific publishers of books on complementary and alternative health modalities, including Tai Chi, Qigong, and Traditional Chinese Medicine. Taiji and Qigong Newsletter – Center for Taiji Studies. Dr. Yang Yang. University of Illinois Kinesiology Department. See the Omega Institute background info and video on Yang Yang. Qigong (also spelled Ch’i Kung) is a powerful system of healing and energy medicine from China. It is the art and science of using breathing techniques, gentle movement, and meditation to cleanse, strengthen, and circulate the life energy (qi). Qigong practice leads to better health and vitality and a tranquil state of mind. In the past, qigong was also called nei gong (inner work) and dao yin (guiding energy). One of the best places for getting information on Qigong Research is the Qigong Institute. Here are the three Qigong Organizations available to practitioners. The concept of Qi -Similar to the theory of yin-yang, qi was derived from ancient Chinese philosophy, which believes everything is related. In traditional Chinese medicine, qi is treated as the fundamental substance of the human body, and its movements explain various life processes. Qi in its physiological sense constitutes, replenishes and nourishes the human body.? Qi is often called ?vital energy? because it is believed to be the motive energy derived from the essential substance for various vital processes. Try out our online Qigong Classes!